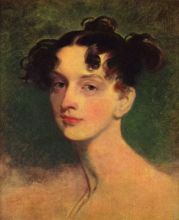 Sir Thomas Lawrence (April 13, 1769 – January 7, 1830), was a notable English painter, mostly of portraits. He was born in Bristol. His father was an innkeeper, first at Bristol and afterwards at Devizes, and at the age of six Thomas was already being shown off to the guests of the Bear as an infant prodigy who could sketch their likenesses and declaim speeches from Milton. In 1779 the elder Lawrence had to leave Devizes, having failed in business and Thomas's precocious talent began to be the main source of the family's income; he had gained a reputation along the Bath road. His debut as a crayon portrait painter was made at Oxford, where he was well patronized, and in 1782 the family settled in Bath, where the young artist soon found himself fully employed in taking crayon likenesses of fashionable people at a guinea or a guinea and a half a head. In 1784 he gained the prize and silver-gilt palette of the Society of Arts for a crayon drawing after Raphael's "Transfiguration," and presently beginning to paint in oil. Abandoning the idea of going on the stage which he had briefly entertained, Lawrence came to London in 1787, was kindly received by Sir Joshua Reynolds , and became a student at the Royal Academy. He began to exhibit almost immediately, and his reputation increased so rapidly that he became an associate of the Academy in 1791. The death of Sir Joshua in 1792 opened the way to further successes. Lawrence was at once appointed painter to the Dilettanti Society, and principal painter to King George III in lieu of Reynolds. In 1794 he was a Royal Academician, and he became the fashionable portrait painter of the age, his sitters including England's most notable people, and ultimately most of the crowned heads of Europe. 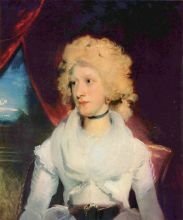 Caroline of Brunswick was one of his favourite subjects, and is reputed to have been his lover for a time. 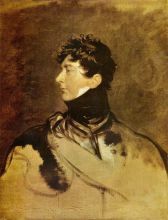 In 1815 he was knighted; in 1818 he went to Aachen to paint the sovereigns and diplomats gathered there for the third congress, and visited Vienna and Rome, everywhere receiving flattering marks of distinction from princes, due as much to his courtly manners as to his merits as an artist. After eighteen months he returned to England, and on the very day of his arrival was chosen president of the Academy in room of Benjamin West, who had died a few days before. He held the office from 1820 to his death. He was never married.